Speaking after the meeting with his South Korean and Japanese counterparts in Seoul, Pompeo also confirmed their shared commitment to North Korea’s “complete, verifiable and irreversible” denuclearization. North Korea’s state-run Korean Central News Agency reported Wednesday that the two leaders agreed to the principle of a “step-by-step” process and US President Donald Trump expressed his intention to lift sanctions “over a period of goodwill dialogue” between the two countries. The report was interpreted as meaning the US would grant rewards -- such as sanctions relief -- to North Korea as the reclusive country takes steps to denuclearize, a process which Washington has adamantly opposed. 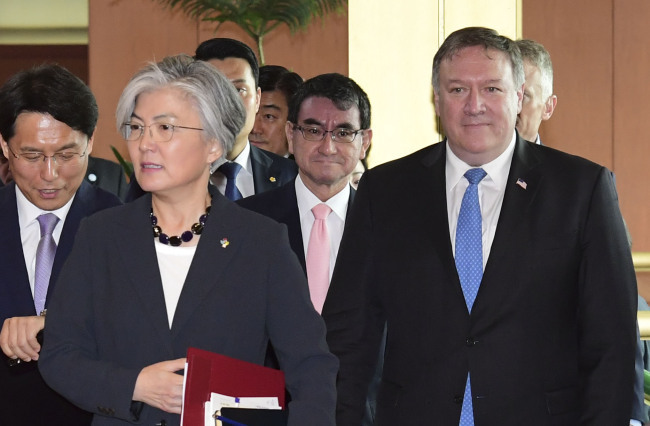 Pompeo was in Seoul to hold a meeting with South Korean Foreign Minister Kang Kyung-wha and Japanese Foreign Minister Taro Kono in Seoul to brief the officials on the outcome of the US-North Korea summit that was held on Tuesday in Singapore. While the joint statement signed by Trump and Kim said the leaders pledged to work toward “complete denuclearization” of the Korean Peninsula, Trump drew criticism for backing down from his hard line on North Korea’s nuclear program. “The world should rest assured the United States, Republic of Korea and Japan remain committed to achieve complete, verifiable and irreversible denuclearization of North Korea,” Pompeo said. He added that “complete denuclearization” stipulated in the joint statement clearly encompasses the idea of verification, which he said is central to reshaping relations between the two countries. South Korean Foreign Minister Kang Kyung-wha dismissed concerns over a possible crack in the Seoul-Washington alliance, after Trump said the US would halt military exercises with South Korea. “The South Korea-US military exercises issue involves the South Korea-US alliance and involves consultation between our military authorities and that will be the case in the future,” Kang told reporters. “My understanding is that Trump made the statement to enhance the momentum of dialogue,” she said, describing the Singapore summit as a historic turning point. Trump said at his post-summit press conference in Singapore that the US will stop the allies’ “war games” while talks with North Korea are underway, triggering concerns of a weakening of the South Korea-US alliance here. Pompeo later defended Trump’s position, saying that the joint exercises could be brought back if negotiations with Pyongyang are not productive. CNN reported Thursday that the Trump administration is expected to announce the formal suspension of planning for multilateral military drills, the Ulchi Freedom Guardian, on the Korean Peninsula in August, citing administration officials. 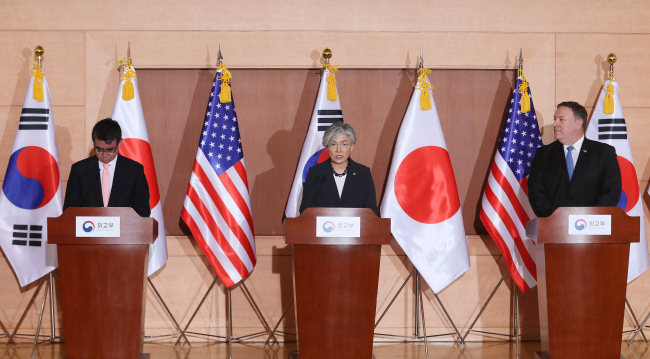 Japan’s Foreign Minister Taro Kono said that Japan understands any suspension in South Korea-US joint drills is “contingent” upon North Korea’s actions toward denuclearization. As for the possibility of North Korea-Japan talks, Kono said there are currently no planned high-level talks between the countries, but added that Japan is willing to sit down for talks with North Korea to resolve the issue of Japanese nationals abducted by North Korea. Meanwhile, Pompeo paid a courtesy call to South Korean President Moon Jae-in earlier in the day during his first official visit to South Korea since taking his post. He left for China to meet with his counterpart Wang Yi later in the day.